Just took in my 2013 Ford Ranger 2.2 for its 75k service at a Ford Dealer. I was charged for 8 litres of oil. Does anyone know the oil capacity for this model. Incidentally, I was charged 7600 bt for this service. Does this sound reasonable? Thanks for any views or advice. 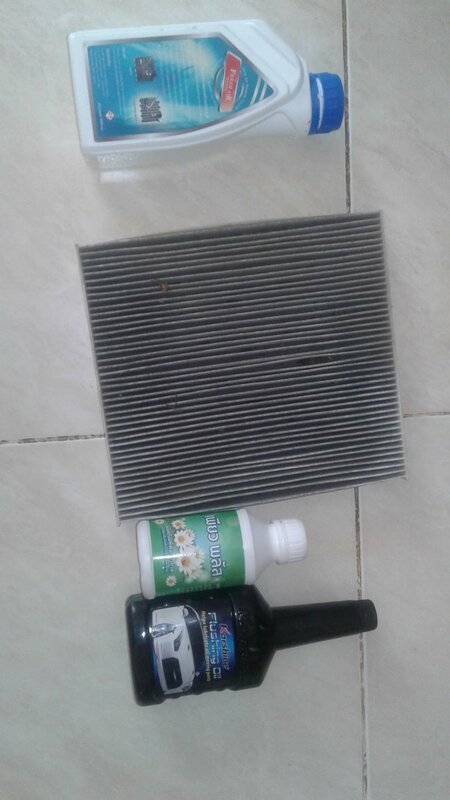 For that money you have had 2 x 4litre cans of synthetic oil, a filter and charged about 2,000bht over the top.. It does take a bit over 8 litres..
Hi Transam, I really appreciate your reply. It has put my mind at rest. Yes I was charged for 2 * 4 litres of oil. Some more help if you can. I do feel that I was ripped off. The service charge was 4515 bt (I am happy with that as that is the published price) but there were 2 more items at 995 bt and 2022 bt. They left empty containers in the car - one appears to be "valve oil ???" and the other is some type of liquid air freshener. There was also a used filter left (maybe air conditioner filter - I am not an expert). I am going back to the place to see what is going on but if you can give me some of your expert advice, I would appreciate it. Seems that's where the extra cash came from...An A/C filter which you didn't ask for...Can you post a screen shot of the bill....? Hi Transam, thanks again. I have posted an image of the bottles etc that were left. On the bill it says the 995 bt was for "oil" - presumably the flushing oil pictured - is this stuff necessary? The other bottles seem to suggest some type of A/C work - again was this necessary. I think I am getting to the bottom of this. When I was waiting for the work to be done, a technician brought a job sheet which I had to sign. I speak no Thai and spoke no English and nothing was explained. I saw the items for 995 bt and 2022 bt but assumed they were part of the service – basically I have been stupid enough to be duped into having work done that was unnecessary. I just hope that other farang Ford owners read this and don’t make the same mistake again. I won’t be using that dealer (Nakhon Ratchasima Ford) again !!! Thanks again Transam, you have been most helpful and I appreciate it. The flushing oil is put in the engine when the old engine oil is still in there. The car is then ran for 15 minutes or so to take all the old oil and sludge out. Not a necessary step and some manufacturers even don't recommend it. A can of Liqui Moly Engine Flush will cost you around 500 to 700 baht. So your saying that black bottle that is labeled "Flushing Oil" is not infact flushing oil ? When I google "flushing oil additive" there is very few hits for anything in a 5 liter can infact most seem to be small plastic bottles. Years ago I used to use a wynn's one and it was a 500ml can from memory. Engline flush concentrate comes in 500ml bottles while flushing oil comes in 5 liter bottles. The difference is that 500 ml bottles are added to the old oil before its drained. Flushing oil is put in after the old filter is changed and the old oil is drained. The flushing oil then flushes the engine. After that step the new oil is put in the engine. Not sure what the advantages and disadvantages are of both.